This edited collection of letters by William Empson (1906-1984), one of the foremost writers and literary critics of the twentieth century, ranges across the entirety of his career. Parts of the correspondence record the development of ideas that were to come to fruition in seminal texts including Seven Types of Ambiguity, The Structure of Complex Words, and Milton's God. The topics of other letters range from Shakespeare's Dark Lady toMarvell's marriage and Byron's bisexuality. Empson relished correspondence that was combative, if not downright aggressive. As a result, parts of this edition take the form of a serial disputation with other critics of the period, including Frank Kermode, Helen Gardner, Philip Hobsbaum, and I. A. Richards. Other notablecorrespondents include A. Alvarez, Bonamy Dobree, Leslie Fiedler, Graham Hough, C.
K. Ogden, George Orwell, Kathleen Raine, John Crowe Ransom, Christopher Ricks, Laura Riding, A.
L. Rowse, Stephen Spender, E. M. W. Tillyard, Rosemond Tuve, John Wain, and G. Wilson Knight. All readers of literary history and criticism will stand to benefit from this edition. Empson is universally credited as the man who 'invented' modern literary criticism, so that all of his writings make a signal addition to the canon of his works. 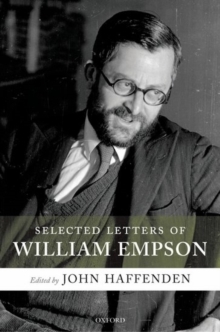 This selection provides a context for the evaluation of Empson's total literary output; and in many letters Empson seeks to defend his ideas against both published and personal attacks. This volume not only fills in all the missing links, it adds upto a completely new volume of critical writings by Empson.